November 30, 2015  Donald Trump met with black pastors Monday in an event that was at first billed as an endorsement. Trump has been criticized for his suggestion that a Black Lives Matter protestor who was roughed up at a Trump event deserved it. November 30, 2015  Sen. Ted Cruz is stepping up his game in Iowa by going after the state's influential evangelical voters. November 30, 2015  He spoke about bribery, war, water and peace between Muslims and Christians — but stayed silent on gay rights. November 30, 2015  Pope Francis spent Sunday with Catholics in the Central African Republic. On Monday, the last day of his Africa trip, he will address Muslims. Religious sectarian violence has divided the nation. November 29, 2015  Pope Francis is calling for communal and religious harmony during a visit to the Central African Republic, the final stop of his first African tour. The country has been racked by a deadly conflict driven by Christian and Muslim militias. November 27, 2015  The pope arrives in the country on Friday. Commentators James Kassaga Arinaitwe and Viviane Rutabingwa give him a crash course in the country's issues. 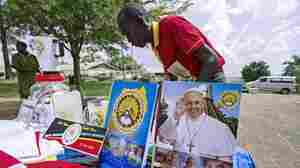 November 27, 2015  Pope Francis travels from Kenya to Uganda on Friday — the second stop on his trip to Africa. The pope began the day in a place world leaders more typically ignore — the impoverished slums of Nairobi. November 26, 2015  Pope Francis is making his first-ever trip to Africa, where he is stopping in Kenya, then Uganda and the Central African Republic. All three nations are dealing with issues related to religious extremism. 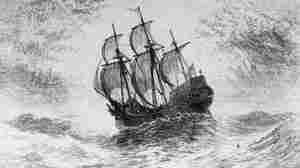 November 26, 2015  Conservatives who want to emphasize America's Christian roots embrace the story of the Pilgrims and the Mayflower Compact. But some historians say their role in the country's founding is overstated. November 26, 2015  Many Muslim-Americans say the current political climate is worse than the aftermath of the Sept. 11 attacks. 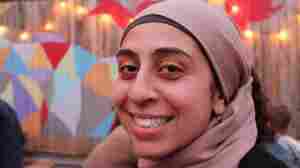 Many Muslims who once voted Republican, say don't feel like they have a home in that party. November 26, 2015  Pope Francis is in Kenya at the start of his first trip to Africa. His message: religious tolerance and help the poor. 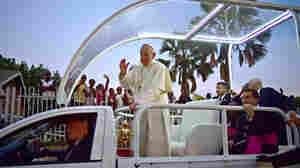 The pope celebrated an open-air mass in the Kenyon capital Nairobi on Thursday. 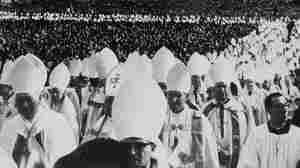 November 26, 2015  Fifty years ago, 40 bishops signed a pledge to make Catholicism a church for the poor. It was soon set aside, but with Pope Francis focused on the downtrodden, that notion could be revived. November 25, 2015  Father Moses, an Eritrean priest, fled his homeland for Italy 14 years ago. His mission preaching to refugees has new urgency with the recent flood of migrants, including many of his compatriots.